The first step to becoming a welder in Oklahoma is to learn the trade. Attending a dedicated welding program at a trade school offers an advantage over an apprenticeship, as welding training can be completed in just months at a vocational school, while an apprenticeship can take several years, according to the Bureau of Labor Statistics 1. After completing training, one will usually need to obtain a welding license, but the requirements differ by state and locale. 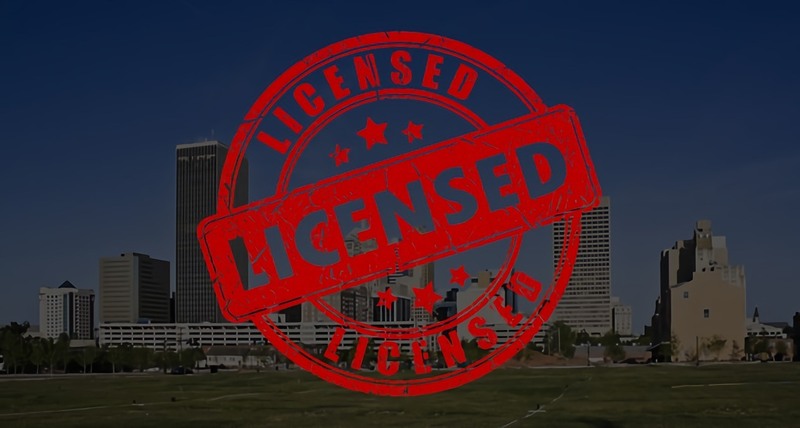 Following are some of the licensing options and requirements in the state of Oklahoma. In order to work as a welder in Oklahoma, one needs to pass a test and then submit the test results, ID and a $25.00 fee, as well as a completed application form, to the Oklahoma Department of Labor. You do not need to have on-the-job experience in order to obtain this form of certification; however, there are limitations as to what type of welding you can do. For example, this license does not permit welders to work on boilers and pressure vessels without the supervision of an employer that is certified by the American Society of Mechanical Engineers or the National Board of Boiler and Pressure Vessel Inspectors. To renew this form of certification, you will need to fill out an application form and pay a fee. However, applicants who fail to renew their welding certification within a year’s time will need to take the welding test over again. Field welders handle specialized tasks related to structural steel components. To work as a field welder, one will need to obtain field welder certification from the Oklahoma Department of Transportation (ODOT). An aspiring field welder will need to bring some of the equipment needed for the test, which is a hands-on display of his or her skills. After passing the test and receiving certification, a field welder will need to have a resident engineer sign the reverse side of the certificate. The certificate automatically expires if one has not done field welding for a year or more. A person who takes a pipe welding test will need to show proficiency in different types of arc welding, such as shielded metal arc welding, gas metal arc welding and gas tungsten arc welding, as well as proficiency in oxyfuel gas processes. Furthermore, aspiring pipe welders who want to be able to work on weldments on boilers and pressure vessels must first find employment with a company that has a valid Certificate of Authorization from either the American Society of Mechanical Engineers or the National Board of Boiler and Pressure Vessel Inspectors. In order to be qualified to weld pipe in all positions, a welder must pass the following tests: 2-G and 5-G or 6-G.
Welding inspectors handle a wide range of jobs. They inspect base materials, welding materials and the final welding job, ensure that all welders working for them (or for their company) are properly certified, and much more. The Oklahoma Welding Act notes that welding inspectors, unlike other welders, must have on- the-job experience in order to apply for certification in this field. Aspiring welding inspectors must show they have experience with both welding maintenance and repair, be able to understand nearly a dozen different types of welding, and also show ability to write clear and concise reports. After completion of welding inspector training in OK you must pass a test to obtain certification to work in Oklahoma. The Plumber and Pipefitters Local 344’s Association offers two forms of certification directly related to welding. These are United Association Welding Certification and Orbital Welding Certification. These forms of certification do not take the place of a state license but can give one an advantage when looking for work. Alternatively, a welder may want to obtain one or more certificates from the American Welding Association. As you can see, there are plenty of welding certification training options to choose from. You can either choose a single field of specialization or take a number of tests and work in various types of welding jobs. An aspiring welder in the state should consider the possibilities and then choose the career path that best suits his or her needs and talents. All welders, however, must learn the trade first, and schools like Tulsa Welding School (TWS) offer training programs that can be completed in as little as 7 months. The campus is conveniently located in Tulsa, OK, and serves the surrounding areas of Oklahoma City, Broken Arrow, Tuttle, and Norman. To learn more, contact TWS today.